I’d long suspected that Trader Joe’s had lost their marbles, but I didn’t realize they’d actually gone insane. How can I tell? Because Trader Joe’s Pumpkin Spiced Pumpkin Seeds is the sort of mad creation that only the incomprehensible visions of true insanity can show. We know that TJ’s is willing to put pumpkin in every last thing they can get their hands on, but putting extra pumpkin in pumpkin itself? That’s as far down the rabbit hole as you can go. There’s so much pumpkin here that it’s liable to collapse into some sort of pumpkin-induced singularity – sucking the entire world into one infinitely dense, rapidly rotating pumpkin. Adding pumpkin spices to pumpkin seeds is the food equivalent of clutching your head while rocking back and forth and whispering “pumpkin-pumpkin-pumpkin-pumpkin” to yourself ceaselessly in the corner of a dark room. That said, these things are actually pretty good. Roasted pumpkin seeds are, like peanut brittle, one of those snacks that are only ever trotted out because they’re in season. I’m sure there are people out there who might eat more than a handful of roasted pumpkin seeds out of curiosity/politeness, but I’ve never met them. Generally, roasted pumpkin seeds are served up with some sort of savory spice on them – paprika, cumin, oregano, etc. Less often you’ll find them mixed with cinnamon and sugar, or some other sweet version. Trader Joe’s one ups all these recipes with their excellent preparation. For starters, they skip the whole pumpkin seed and go right for the meat of the thing – in this case the pepita, or hulled pumpkin seed. This means you aren’t dealing with any of the semi-edible, obstinate pumpkin seed shells, just the crunchy, nutty seed itself. The second brilliant step, is that TJ’s treats the pepitas like you would a honey-roasted peanut. They aren’t screwing around here with the seasoning – each little seedling is blasted front-to-back and top-to-bottom with an even dusting of sugar and spice. This gives them a sweet, satisfying, roughness that balances fully against mealier, dry nuttiness of the pumpkin seed itself. 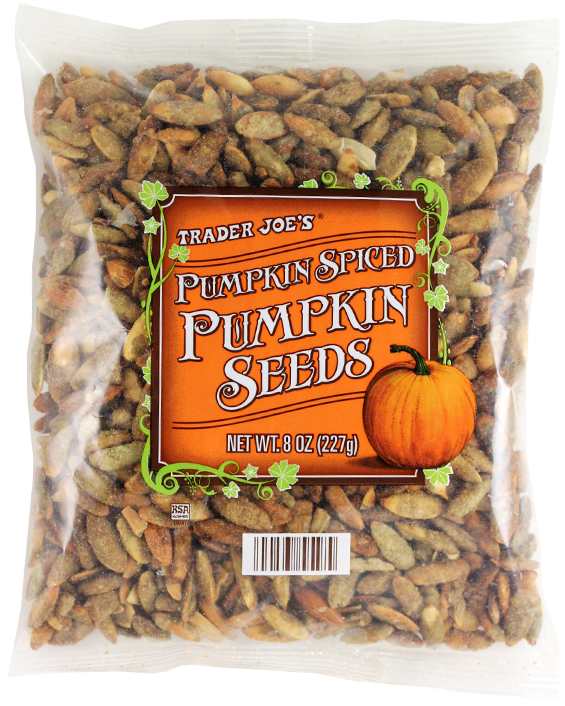 Of course, it’s not just any spices we’re talking about here – Trader Joe’s Pumpkin Spiced Pumpkin Seeds are coated with a mixture of ginger, cinnamon, nutmeg, allspice and, of course, plenty of sugar. While the sugar content will make you think of honey roasted peanuts, the other spices do a good job of approximating the flavorful complexity of a traditional pumpkin pie. The result is something you won’t find anywhere else on the market. There’s been a huge uptick in exotically spiced nuts in recent years – from chili-spiced peanuts to honey-mustard almonds – but pumpkin pie spiced nuts haven’t been done yet. The result is an addicting and enjoyable snack – albeit one that might perform better on a different nut. The pumpkin seeds, although well prepared, are still waffer-y and dry, with a tendency to “pulp up” in your mouth in a way that real nuts don’t. While I’d certainly be happy if someone wanted to come out with a pumpkin pie spiced peanut, I won’t turn up my nose at these pumpkin seeds. ‘Tis the harvest season, after all – if there’s ever a time for pumpkin seed it’s now. Setting out a bowl of these at your next autumnal gathering will fit the bill just right. Would I Recommend Them: Sure, they’re tasty and snackable. Would I Buy Them Again: Yeah, I’d substitute these for honey-roasted peanuts. Final Synopsis: Sweet, roasted pumpkin seeds done right. Your description is hysterical! There must be someone in a corner rocking back and forth chanting there…..
Is it sad that I became OBSESSED with those little seeds when I first discovered them!? Trader Joes, you have done it again! Please let me know when you are selling these awesome pumpkin seeds. I am hooked and I got my daughter hooked. Now I cannot find them. Found them last night. Get them while they last. They are delicious.